Already running a month behind schedule because of subtle hydrogen valve problems, launch of the shuttle Discovery was called off during fueling today when an unrelated hydrogen vent line sprang a potentially dangerous leak. NASA will not be able to make another attempt to launch Discovery until Sunday at the earliest, giving the astronauts just three days or so to get off the ground before the end of the March launch window. "It's better to be flying than sitting on the ground," said Launch Director Mike Leinbach. "But our business requires perfection, and our vehicle was not perfect today. And so we're going to stand down, we're going to fix the vehicle and we're going to fly when it IS perfect. And on that day, (shuttle weather officer) Kathy Winters will have acceptable weather!" Winters said she did, in fact, expect fairly good weather throughout the weekend. But engineers will not get access to the suspect vent valve until Friday and completing repairs in time for a Sunday launch try may prove challenging. Another Mission Management Team meeting is planned for Thursday. If the shuttle is not off the ground by March 17 at the latest, NASA will be forced to delay the 125th shuttle mission to the end of the first week in April, after a Russian mission to rotate crews on the international space station. Even if commander Lee Archambault and his crewmates get off Sunday, they will have to give up one of their four planned spacewalks and shorten the flight by two days to make sure the docked phase of their mission is completed ahead of the Russian Soyuz TMA-14 spacecraft's planned March 26 launch from the Baikonur Cosmodrome in Kazakhstan. If the shuttle launch slips to Monday, the crew could be forced to give up three spacewalks, in part because a Monday launch would require a docking on the fourth day of the mission instead of flight day three as currently planned. LIkewise, a launch on Tuesday would be a one-spacewalk mission. The primary goals of Discovery's flight are to deliver a fourth and final set of solar arrays to the international space station; to deliver a replacement urine processing assembly for the lab's water recycling system; and to ferry a fresh station crew member - Japanese astronaut Koichi Wakata - to replace outgoing flight engineer Sandra Magnus, who plans to return to Earth aboard Discovery. Going into Discovery's launch campaign, space station managers agreed that three spacewalks, devoted primarily to "get-ahead" work for upcoming assembly missions, could be deferred to the space station crew. The three primary objectives of Discovery's flight can be accomplished with a shortened, one-spacewalk mission in a worst-case scenario. A launch Sunday would be targeted for around 7:43:38 p.m. Assuming an on-time liftoff, Discovery would dock with the space station around 4:50 p.m. on March 17. The new starboard 6, or S6, solar array nestled in Discovery's cargo bay would be installed during a spacewalk by Steven Swanson and Richard Arnold starting around 1:13 p.m. on Thursday, March 19. Two more spacewalks would be carried out March 21 and 23 before the shuttle undocked on March 25. Landing back at the Kennedy Space Center would be expected the afternoon of March 27, the day after the Soyuz TMA-13 launch and the day before the new crew's docking. With Discovery already running a month behind schedule because of problems with gaseous hydrogen flow control valves - an issue unrelated to the vent line trouble - today's delay was a frustrating disappointment. There were no other technical problems of any significance and forecasters were predicting near-perfect weather. But during the automated procedure to pump a half-million gallons of liquid oxygen and hydrogen rocket fuel into Discovery's huge external tank, sensors detected a significant gaseous hydrogen leak at an umbilical where a vent line hooks up to the side of the tank. 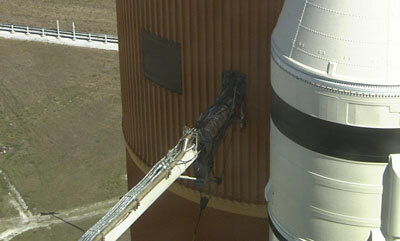 The vent system is used to regulate pressure inside the hydrogen section of the tank as it is being filled for launch. As some of the supercold liquid boils off inside the tank, pressure builds up, the vent valve is opened and gas is routed to a "flare stack" near the pad where it burns harmlessly away. Similar problems have occurred in the past and Leinbach said it was usually possible to clear the system by cycling the valve a few times. Today, the valve was repeatedly cycled by the leak did not go away. Because of the threat of fire from free hydrogen near the shuttle, Leinbach ordered engineers to drain the tank, easing the internal pressure that required venting. "It is the system that maintains pressure inside the hydrogen tank as we're filling up," Leinbach said. "As we put hydrogen in the tank, it does start to boil off and therefore it increases the pressure inside the external tank. We open this valve briefly to let some of that pressure out, it's a very standard thing that happens several times during fueling. "When we were going through that phase with the hydrogen low in the tank, the temperature at the disconnect was relatively high and when we opened the vent valve early in tanking, we didn't see any leakages at all. It's when we got virtually completely full, 98 percent full, so now the temperature is lower and we went into the topping routine and opened that vent valve again, now with the colder temperatures we saw the leak. "Again, it's external to the flight element," Leinbach said. "There's nothing leaking internal. It's when we open that vent valve to control pressure in the tank that we see the leakage overboard at that vent valve. ... All the instrumentation picked it up. It was very easy thing to diagnose from the 'we have a problem perspective.' We won't know what the problem is until we get our hands on it. "We were never in any danger of over pressurizing, we were never in any danger of under pressurizing," he said. "It's just that every time we opened that valve to keep that pressure steady, we saw the leak." Despite the disappointment, Mission Management Team Chairman Mike Moses said the launch team would take the latest delay in stride and not make another attempt to launch Discovery until it is safe to do so. "That's life in the space business," he said. "Sometimes things happen."